I remember when I was a kid, I must have been about 6 or 7. 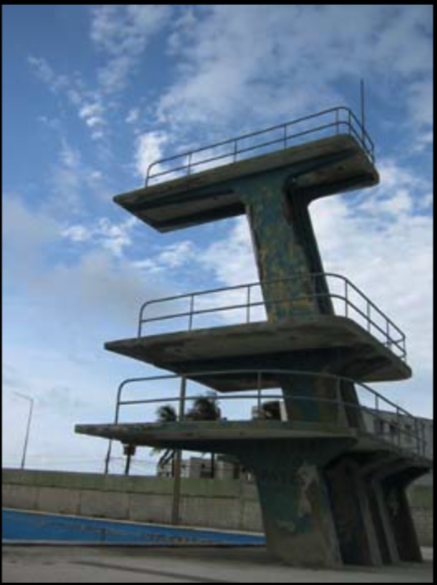 All the neighborhood kids would go to the local “plunge” every summer and I would watch all the older kids going to the top diving platforms and making their dives look seamless. In reality, their dives were not so great but I didn’t see it that way. I mentioned to my brother that I wanted to try it and he told me to wait until I was older. I decided (without my big brother’s permission) to climb up the highest platform! I was determined and no one was going to stop me. I cut through the line of older kids as they screamed at me to get in back of the line. I was immune to their pleas while making my way up the stairs and finally, in what seemed an eternal climb, I had reached the platform of the diving area. As I got closer to the edge of the diving platform, my body froze! The closer I got to the 33 foot drop, the more slowly my body was moving. I shouldn’t have to tell you that my dive was not a perfect 10. I know it was in the minus figures. I was screaming so loud that the kids probably heard my screams even when I was under water! Even though the story of the famous dive that summer grew over the years to become a legend, I know in my heart that it was by sheer accident and by my brother’s decisive act of helping me find the fastest and most direct way down to the pool. Just like that incident, God has a way of placing us in circumstances that will stretch us spiritually, mentally and physically. We must learn that God will never push us to the point of where we will not handle what comes our way. What my older brother Eddie realized, was that I had made my mind up to climb to the top and had I stopped at just the platform, I would forever be afraid of that platform. Eddie saw me and knew that I would freeze up. How did he know this? Because he at my age, had tried the same thing and went back down feeling defeated. It took him a few years later to conquer that 33 foot platform. II. When we are stubbornly wanting to do things our way, sometimes we will feel a Hand come out of nowhere to nudge us through the situation we put ourselves in. III. There are other times when God will guide us when we are ready to tackle things, He will help us through each of the circumstances that He is pointing us to go through. This is the state where we always need to be in. Not going too forward on our own and then realizing that we need to make a disillusioned retreat. Nor do we want to be in the opposite situation, which is standing still, afraid of what the future has for us, questioning everything over and over before taking a leap of faith.